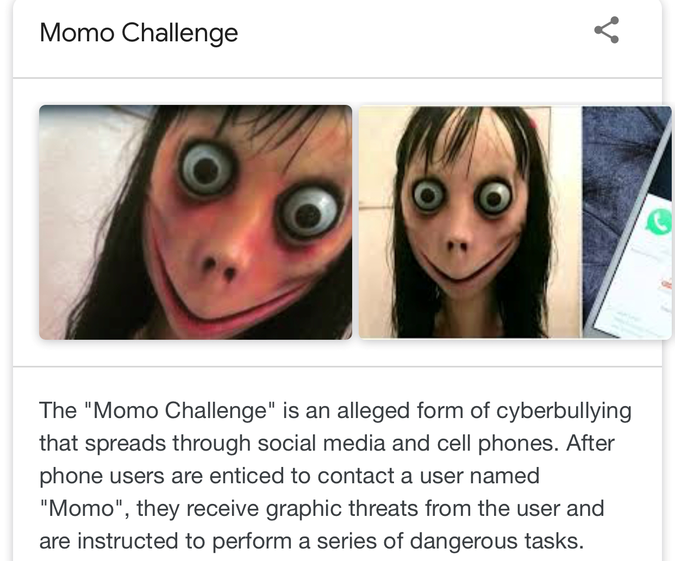 A parent has brought to our attention concerns about a disturbing trailer video preceding clips on YouTube called 'momo challenge'. Apparently, the momo- character (see Pic below) starts coming out of an egg and telling the children to play hide and seek but then moves on to telling the children to turn the oven on and take pills. The character also tells the children not to tell their parents, which goes against everything we are teaching children about keeping safe online. Please make yourself aware of this by checking YouTube film clips. We have tried to access this information at the school but are pleased to report that it was blocked by our filtering system. Your own filters may need updating to ensure that this content does not come through to your children at home. We hope you find this information useful in protecting your children from unacceptable and disturbing online content.